Genesis addon combines both GoTV and GoMovies into one simple to install plugin. Many sources are used for the video content and playback is shown in a style not too dissimilar to Netflix. Genesis Kodi plugin offers HD playback, content downloading, easy to interface, pause/resume playback. Genesis still leaves room for a Kodi Live TV addon; one that allows you to enjoy TV shows from different countries and in different languages, perhaps organized on topics or channels. 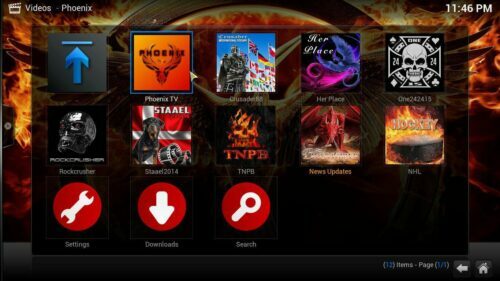 Phoenix Kodi Addon is an addon you could use to this end. This addon allows you to watch TV shows from the comfort of your couch, through your internet connection, and it has some cool channels worth checking. Too close to call? You decide!